When referring to any type of sub-floor ventilation, positive cross flow ventilation is the desired result when investing in sub-floor ventilation solutions and equipment. Cross flow ventilation is a common term used in the sub-floor ventilation industry. Cross ventilation needs to be achieved in any sub-floor ventilation situation as this is critical. What is cross flow ventilation? Cross flow ventilation can be an effective sub-floor ventilation process whereby air flows from a supply point (this can also be referred to as supply air or induced air) to an extraction point which is referred to as expelled or extracted air. Cross flow ventilation in sub-floor ventilation situations is a more sensitive issue with in-line ventilation fan systems and ducting because if the in-line sub-floor ventilation system has inadequate supply air this can cause the in-line sub-floor ventilation system to overheat and can cause the fan ventilation system to burn out prematurely. Supply air can also starve an in-line fan sub-floor ventilation system when the supply duct is too long or too small. When using Envirofan sub-floor ventilation systems the problems discussed with in-line sub-floor ventilation systems are not a consideration as Envirofan sub-floor ventilation systems do not require ducting in 98% of cases. 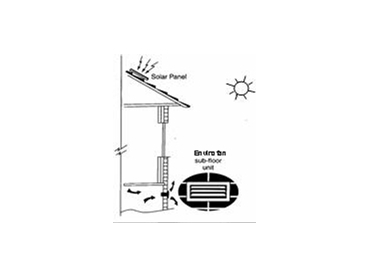 It is Envirofans practice that sub-floor ventilation should move freely and uninhibited throughout the sub-floor area. So when our focus is on a sub-floor ventilation project, to gain the possible positive cross flow ventilation outcome ensure that if possible that the supply air or induce air via the sub-floor ventilation system is from the drier aspects of the dwelling which would be a northern or western aspect and the extracted air via the sub-floor ventilation system is to the southern or eastern side of the dwelling. When investing in sub-floor ventilation it has to be done right the first time for the reason that if the client or the sub-floor ventilation company does not get it right, things would have to be undone, which may possibly incur unnecessary time and expense to the customer? For example sub-floor ventilation advice was given to a caller on a popular D.I.Y radio program to drill out the purps between the brickwork to allow increased sub-floor ventilation. Now with the time the caller has to invest in executing this, wear and tear on equipment (drill and drill bits) the effort to get the sub-floor ventilation effective in accordance with this advice would be futile. Mainly remedial work done by Envirofan in sub-floor ventilation is because the building has raked out purps and terracotta vents. A passive vent is only as good as the wind blowing through it. This is not a problem if you live on a hill in the country with a constant breeze aerating your sub-floor area. In the city sub-floor ventilation is inhibited by other structures, boundary fences and raised ground levels by landscaping. This can cause a swathe of problems such as entrapped humidity in the sub-floor area which can encourage termites, dry rot in timber flooring structures, an a unhealthy environment inside the home that can cause respiratory problems to the occupants.